When Edmund Hillary first conquered Mt. Everest, Sherpa Tenzing Norgay was at his side. Indeed, for as long as Westerners have been climbing the Himalaya, Sherpas have been the unsung heroes in the background. In August 2008, when eleven climbers lost their lives on K2, the world's most dangerous peak, two Sherpas survived. They had emerged from poverty and political turmoil to become two of the most skillful mountaineers on earth. Based on unprecedented access and interviews, Buried in the Sky reveals their astonishing story for the first time. Peter Zuckerman and Amanda Padoan explore the intersecting lives of Chhiring Dorje Sherpa and Pasang Lama, following them from their villages high in the Himalaya to the slums of Kathmandu, across the glaciers of Pakistan to K2 Base Camp. When disaster strikes in the Death Zone, Chhiring finds Pasang stranded on an ice wall, without an axe, waiting to die. The rescue that follows has become the stuff of mountaineering legend. 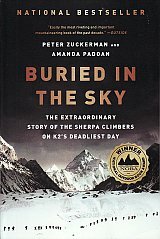 At once a gripping, white-knuckled adventure and a rich exploration of Sherpa customs and culture, Buried in the Sky re-creates one of the most dramatic catastrophes in alpine history from a fascinating new perspective.